On a narrow alley just beyond the back gate of the Hırdavatçılar Çarşısı in Karaköy, we distinctly heard the bleat of a sheep. Turning the corner, we saw men wearing coveralls and vests with “Makita” stitched over the breast seated at low tables laughing through mouthfuls of flatbread. “Me-e-e-e-eh,” one of them bleated again as blueish grill smoke belched out of the restaurant enveloping the bleating man, the street and then us, in a hazy barbecue dream. This was supposed to be a quick run down to the Karaköy hardware market for a faucet and some sandpaper, but our culinary backstreets antenna, always up, automatically changed the the afternoon’s priorities. So we followed the commotion to a tiny restaurant called Urfa Şark Sofrası and pulled up a stool outside of this humble kebab shop. The owner, Saim Bey, convinced us to start with kuru fasulye, which was kept warm in a charred clay pot at the front. More famous in Turkey’s Northeast and Central Anatolian regions, these beans were done in the Black Sea style with meat and plenty of butter, but also delivered a little extra kick of heat, which we attributed to the place’s link to Urfa, home of the diabolical isot, an oily, almost black dried and crushed red pepper. Faced with the difficult task of choosing among a list of kebabs, we ordered a mixed grill platter that included kanat (chicken wings), patlıcanlı kebap (minced lamb shish interrupted by thick slices of eggplant), and a kebab called haşhaş (pronounced “hash hash”), which was as intoxicating as the name indicates. 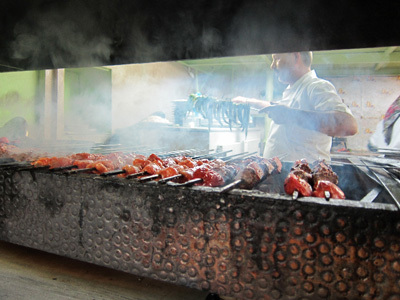 The meat was buried under mounds of fresh bread slathered with a spicy rub, rolls of soft lavaş and spicy green peppers and tomatoes hot off of the grill. Working our way through the platter, we kept seeking out chunks of the particularly crumbly, crispy yet soft shish meat. Finding the last piece hiding under a triangle of lavaş, we asked Saim Bey what we were eating. “That’s haşhaş kebabı, knife-cut beef with lamb fat, süper!” he said. Super, indeed, we agreed – even bleat-worthy. They were sold out of the kurufasuliye but still had the hashas. Other than the kebab at Kara Mehmet Kebab Salonu this is the best stick of meat I’ve ever had in Istanbul. While nobody can top Kara this was one healthy blast of fatty, charred flesh. The lavash had seen better days but you don’t come here for bread. This is a grade A meat house, tucked away down a tiny alley in Karakoy. I loved this place since I found it through your book-guide and used to go very often, always with amazing mouth-watering results. Unfortunatel,y I went last Saturday and the “restaurant” is still there though the owners have changed. They didn’t explain me if the kurdish that were running the place have moved somewhere else or what happened but I will miss the hashasi kebabi.